Gives the chemistry backbone to the broader science of winemaking. Also included is a chapter on the history of wine chemistry and ancient winemaking practices. This is the ultimate pH meter for the advanced wine maker or small winery. The Portable wine pH Meter features Electrode monitoring and 7 memorized buffers for calibration. HI 2222 is a logging microprocessor-based pH/ORP/temperature bench meters with Calibration Check. Calibration Check performs a set of diagnostic tests during calibration using the history of electrode slope and offset to detect problems that can cause loss of accuracy. Why Measure the pH of Wine? Measuring the pH of a wine is one of the most important tests in a winery. Here are some facts on pH, why we need to know about it and how to measure the pH of your wine accurately. Most of us learnt about pH in chemistry class at school. If you can't remember what it is, here is a refresher - 'pH is a measure of a solutions acidity or alkalinity', pH means Positive Hydrogen ion, and the pH scale is from 0 to 14. A neutral solution numerically is equal to 7, while the more alkaline the solution, the higher the number increases. An acid solution decreases from 7 as the acid level increases. Class over! Measuring pH is of fundamental importance to any winemaker, it tells him or her so much about the wine generally. The color, oxidation, biological and chemical stability are all influenced by pH, as are the amount and strength of acids present. Why is it necessary to measure pH? Because it tells us how stable the wine is. Some micro organisms find it easier to grow at a higher pH, so it is important to control this growth. This is done by accurate and consistent use of sulfur dioxide (SO2) as an anti bacterial agent. The effectiveness of control reduces as the SO2 level reduces and the wine pH increases. What is the optimum pH for a wine? The optimum range for a good quality wine is pH3.2 to pH3.6. 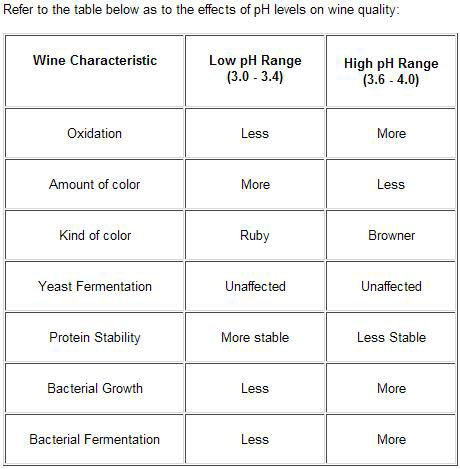 Lower than pH3.2 will diminish survival rates of both yeast and malolactic bacteria, while higher than pH3.6 will enable harmful bacteria to flourish and therefore cause the wine to deteriorate. Is there a relationship between pH and total acidity? To some extent there is a relationship between the two, however it is not that straight forward. As pH can measure the amount of acids present, ie. the total quantity of acids, it also measures the tartaric to malic acid ratio as well as the amount of potassium in the wine. Wines containing lower acid and more potassium will show higher pH values, whereas wines with more tartaric acid, less malic acid and less potassium will have lower pH values. As wine contains a mix of acids, predominantly tartaric, with some malic, citric and lactic, pH alone cannot express the wines acidity. And so this is why titratable acidity (TA) is also measured. TA represents the amount of tartaric acid that is present in the wine, and values range from 7-12 g/l. How can the pH and TA levels be adjusted? It is convenient that pH and TA can be adjusted together at the same time. To increase the acid, many winemakers add pre-purchased tartaric acid powder for red wines, and maybe a combination of two thirds tartaric to one third malic for whites. It is difficult to achieve an exact pH especially as wine is a buffered solution. Predicting how a certain g/l acid addition will adjust the pH is not easy. Even professional winemakers struggle with this, and ultimately it comes down to experience and vineyard knowledge. NB. Not to forget that it is a decision always based on other factors, such as Balance, Taste and Flavor as well. Tartaric acid is a naturally present acid in the grape. It is not consumed by yeasts or by any other microorganism during the winemaking process, but remains in the wine. These small acid crystals - much the same size as grains of sugar - can be removed from the wine by a process of cold stabilization. Failing to remove the crystals when the wine is cold will allow them to either redissolve and stay in the wine, only to settle out if and when the wine gets cold. If you have ever seen these small crystals at the base of a glass of wine or bottle, don't worry, they are completely harmless. They are referred to as 'potassium tartrate crystals' or 'wine diamonds', and are just rather unsightly. Hanna Checker-1 Digital pH Meter. This is a small hand-held electronic pH meter which is easy to read and use. It is highly accurate with 0.01 resolution and a replaceable electrode. It does require calibrating solutions. HI 222 Professional pH Meter. This meter allows for automatic pH calibration at pH3 and pH7. Most conventional pH meters fail to warn the user when the pH electrode is dirty, but this meter uses Hanna's signature Calibration Check(TM) technology to detect a dirty electrode and warn the user during calibration. It can be seen how important it is to measure pH, so you will end up with an attractive, stable and well balanced wine. It might sound complicated, but using your educated wine palate along with a little pH testing meter, you will never look back and leave it to chance. Every winemaker, at some stage, has had to deal with having to adjust the pH of the wine. It doesn't matter where the grapes come from - a hotter or colder grape growing climate - the winemaker will have to face up to the problem of how to adjust the acid and pH. Both the pH and the acid are too high - this is usually the result of excessive amounts of malic acid and potassium. When Total Acidity (TA) is referred to it will be in grams per litre. Some books refer to acid as a percentage, such as 0.7%. To change from percentage to grams per litre is easy, 0.7% = 7 g/l. Different grapes have different buffering capacities. Reducing pH excessively, say from 3.6 down to 3.3 may require about 4 g/l of tartaric acid instead of the bench-mark figure of 3g/l. Adding acid can result in some precipitation of potassium hydrogen tartrate which might affect both the pH and TA values. Therefore, it's advisable to perform laboratory tests. When do you take pH and TA readings? For pH readings post pressing. It's good practice to test the must after a 24 hour settling period to achieve better accuracy rather than taking them actually at pressing time. This settling period can account for a small increase of between 0.1 and 0.2 pH as a result of potassium extraction. For TA readings. Whether acidity readings are taken before, during or after pressing, the TA change will be minimal. Adjustments for acidity should be made pre fermentation. For red grapes having been fermented on their skins, a further increase in pH may be observed post pressing. This is due to the maceration process during fermentation which increases the extraction of skin constituents. In colder wine growing areas and in unfavorable years, many grapes may contain excessive acid levels and so require de-acidification prior to fermentation. How do you de-acidify a must? Reducing acids levels should be carried out with caution and accuracy. Acid reduction with calcium carbonate, potassium bicarbonate or Acidex® CANNOT EXCEED MORE THAN A 0.4% TOTAL REDUCTION. Use at the rate of between 0.67 g/l to 1.53 g/l to reduce TA by 1.0 g/l. If the pH is too low, chalk is not effective for the same reason that cold stabilization wouldn't be effective. Carry out this operation well before bottling - at least three months or so - or else a chalk haze could develop in the bottle. Calcium carbonate is not the preferred method of acid reduction by wineries due to the length of time it takes to complete. There also may well be the possibility of tartrate settling in the bottle. Acidex® - Not recommended on other fruits apart from grapes. This double salt of calcium carbonate is designed to reduce both the tartaric and malic acids in must and wine. Before going ahead with cold stabilizing, the pH of the wine needs to be less than 3.65, otherwise any settling out of potassium bitartrates will result in a decrease in both the pH and TA. Conversely, if the pH is well above 3.65, the pH can increase. The optimum time for proceeding is immediately after the fermentation has finished. It helps if the weather is particularly cold, i.e. below freezing. But remember, if the wine's pH is less than 3.2, cold stabilization will not be effective, as the malic acid content will be higher than the tartaric acid content. Malic acid doesn't precipitate its salts like tartaric acid does. The incidence of tartrates settling out in bottles will be greatly reduced with a wine that has been through cold stabilization, which ultimately avoids the unsightly crystals from being served into a glass. Use at the recommended rate of approx. 1.0 g/l to reduce the TA by 1.0 g/l. It's best if the wine is chilled, although it's fine at cellar temperature. Unlike calcium carbonate, potassium carbonate reacts straight away without leaving any deposit. NB. ALWAYS DO LAB TESTS ON SMALL BATCHES FIRST BEFORE ADDING INTO MAIN WINE. "Wine is a clog to the pen, not an inspiration"